In his final start at Talladega Superspeedway, four-time NASCAR Cup series champion Jeff Gordon nearly notched another restrictor-plate win. The driver of the No. 24 Hendrick Motorsports Chevrolet started the day from the pole and was a factor at the front of the field throughout the 196-lap event. Working well throughout the day with his three Hendrick teammates, Gordon was third when the race ended under caution. By finishing in the top five, Gordon kept his championship hopes alive for another three weeks, as he moves on to the Eliminator Round of the Chase. Lining up third behind eventual race winner Joey Logano on the final restart, Gordon had a plan to either help teammate Dale Earnhardt Jr. get to the lead or make a move for the win on his own. However, he never got the chance as both attempts to finish the race under green-white-checkered conditions were thwarted by wrecks behind him. "I was really looking forward to working with Dale Jr. there at the end," Gordon said after his 16th career top-five finish at Talladega. "When those guys swapped (lanes for the restart), I was like, ‘Oh man, this is going to be tough.’ I thought maybe my only chance was splitting Joey and getting inside of him and getting three-wide and maybe shuffling him out. Unfortunately, I had no idea all that crazy stuff that was going on behind me." Moving on to the Eliminator Round, Gordon is eager to get to work and is heading to three tracks where he has historically performed very well. Gordon has eight wins at Martinsville Speedway, one at Texas Motor Speedway and two at Phoenix International Raceway. "I’ve been saying all along if we can get to Round Three we have an excellent shot at getting to Homestead," he said. "This team is extremely excited for the races coming up, and working extremely hard to make that happen. The season that I’ve had, I’m just overwhelmed and shocked right now that we’ve turned this thing around the way we have since the Chase started. I think now it’s quite the opposite; we have momentum on our side." Gordon noted that all the adversity the team has faced this season has ultimately made it stronger. What the heck? 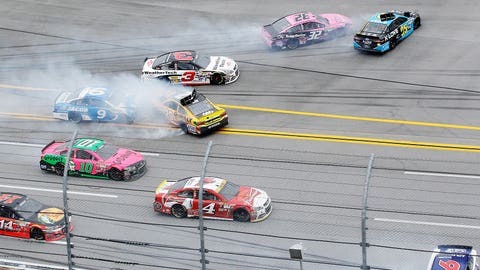 Is Harvick to blame for crazy end to Talladega race? "We’ve worked extremely hard. To shine at the moment that matters, which is right now, that’s awesome," he said. "I think all the things we have been through this year that could be looked at as negative — the way we’ve run, a lack of execution — we’ve learned from it. We’re too strong of an organization, and when you survive those moments, it’s amazing how you can turn it around and become stronger. Our cars have been better, our execution has been better, our communication has been better, and we’ve gotten better results. It’s pretty amazing how we’ve made it through this thing." After making the final restrictor-plate start of his career, Gordon said he was pleased with how the day went and had fun inside the car. "I think I had fun for two reasons," he said with a smile. "One, because we had a fast race car and a shot at winning this race. And racing with Dale Jr. was a blast, pushing him at times. Just the shuffling and everything we had to do, I had a blast. "I’m glad it’s my final one, because most of the time I’m not having a blast out there in these types of races," he said. "This is the memory I wanted to have of my final Talladega race."